The Andre Malraux Museum of Modern Art (MuMa) in Le Havre, where Gilles was born, will be giving carte blanche to Pierre & Gilles for the second stage of a major retrospective held in collaboration with the Museum of Ixelles in Brussels. MuMa's exhibition will consist of over 80 works belonging to large museums and prestigious private collections, produced between the late 1970s and the present. Many of the images have acquired iconic status. Grouped by theme, they make up a sumptuous visual corpus. Pierre Commoy and Gilles Blanchard met 40 years ago, and almost immediately formed the artistic duo Pierre & Gilles. Their forty-year relationship as lovers and artists has produced a body of portraits that hover between photography and painting, nurtured by art and popular culture and transposed into myths. Celebrities such as Madonna, Jean-Paul Gaultier, Stromae and Isabelle Huppert or people close to the artists model as soldiers or sailors, immortalized by the duo's lens then embellished with a paintbrush in a unique style that is a dazzling hotch-potch of references to mythology, religion and fairy tales yet remains rooted in the realities of the contemporary world. Pierre & Gilles have also dreamed up an installation especially for the setting of MuMa. It will be based on the beach huts that are a typical feature of Le Havre and will be displayed in the main concourse of the museum. On the ground floor, they will create a new display by delving into the treasure-trove of the museum's collections. 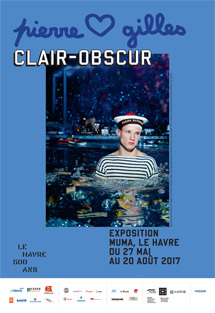 And to highlight the couple's Le Havre back-story, a "cabinet of curiosities" will present a set of unusual personal objects, juvenile drawings and art works and paintings by local artists, arranged in Pierre & Gilles' inimitable style. This will be one of 2017's don't-miss events - a chance to see Le Havre and its emblematic harbour from Pierre & Gilles' uniquely quirky angle!